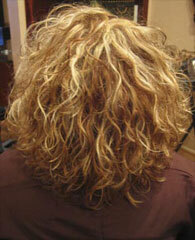 Perfectly comfortable for creating length, fullness, highlights, and/or correcting specific problem areas. We've all heard the horror stories about extensions-from-hell that pull out clumps of hair by their roots within 3-4 weeks after being put on; or the extensions that are put on with glue that leave sticky residues on your scalp (especially the latex-based ones); and the ones that cause red bumps and itchy patches because their poor quality causes allergic reactions. Or maybe you've even experienced some of these catastrophes yourself. Not fun, right? That's when you end up saying, "I've just been to the worst hairdressers ever!" ... and it just might not be their fault. Well, now you don't have to worry about that any more. A very gentle thread technique for applying extensions was first introduced in Asia some time ago and has proved itself so successful there that its developer, Mr. Charles Oh, has recently introduced it to the American market in California. It is also gaining ground in Hollywood, San Diego, St. Louis, Chicago, and now New York. And I'm very excited about this superior hair extension method for my clients. We offer you the Microchet Hair Extensions! Niki Zborower, known to her friends and clients for the past 14 years as NikiZ, is a master colorist, hair stylist, make-up artist, and trainer for other cosmetologists on stage at shows and in salons around the country for Goldwell (a world leader in hair color products). She is a Certified Trainer for the Microchet Hair Extension system. 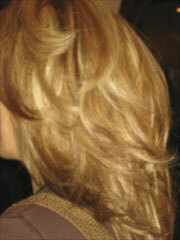 Call Niki directly at 516-816-6452 extensions appointments, consultations, questions, or in-home extension service. For those clients living out of town arrangements can be made to have Niki come to you. Door to door service. Feel free to also inquire about the many other methods of extensions Niki specializes in. Call today to schedule your appointment as only so much time is available and Niki's calendar fills quickly. So, what's so different about the Microchet method AND why should I care? Let me answer the last question first: because, quite frankly, we believe that when you examine all the attachment methods on the market today, you will discover that the Microchet method is the safest, easiest, and most natural looking hair attachment system available. No. The Microchet method is none of the above. What Microchet IS is an exclusively innovative, durable technique for producing beautiful long hair by attaching only fine, high quality human hair, strand-by-strand, to your existing hair using special thread (either the same color as the hair or invisible thread) and a crochet hook. This special process produces a virtually undetectable attachment so that the new hair appears to be growing right out of your own scalp. This process is quick and easy; great for adding length, volume or just to add a touch of color or highlites; extremely lightweight so there is no pulling or stress on your natural roots; and very easily removed by simply cutting the attachment string — so there is extremely little-to-NO DAMAGE to your own hair as compared to the other currently used methods of extensions attachment that use heat and glue; it's more comfortable than methods using braids or cylinders (which use metal attachments that can break your hair); and because this new hair moves independently of your own hair, it is more natural looking than most other methods. There is very little shedding, color stays true, and the hair stays soft and touchable. This is the most gentle technique available today. Hair growth requires that all types of extensions be removed and replaced about every three months, an extremely easy procedure in the Microchet system. And once removed, about 40% of this hair may be re-usable two more times. This saves you money because you won't have to buy all new hair every time we do it. Cutting, coloring and perming of extensions or natural hair are priced separately and added to the final fee. The Microchet Hair Extension system does NOT require heat nor chemicals for attachment nor strong solvents for removal. You can therefore rest easy as the possibility for damage to your hair or scalp from heat and/or chemicals from this process is totally eliminated. The Microchet hair extensions look and feel like your own natural hair after the first day or two as they are so lightweight you won't even know you're wearing them. They have an extremely natural look about them, are easy to wash and style, and can even be colored and permed to provide a variety of styles and moods. SO, WHO COULD BENEFIT FROM THIS PROCEDURE? Microchet Hair Extensions can give you longer, thicker, fuller, sexier hair with a minimum of fuss, bother, and breakage to your natural growth. Looking your best helps you feel good about yourself. Feeling good about yourself promotes feelings of confidence and self-assuredness. Confidence and self-assuredness lead to success in whatever you are undertaking, something everybody wants and strives for. And for those in the public eye, it is a must. From time-to-time, special events like weddings, proms, gala events of one sort or another arise where you want to look extra-special for that extra-special occasion. This would be a very good time to try out the Microchet Hair Extensions. Its ease of application and reputation for not causing undo damage goes a long way toward making you feel at ease and confident that all will be well with this procedure and to allay the fears of the "what if's". As the cuticles in our cuticle hair are all aligned in the same direction, hair tangles and matts are no longer a problem which makes caring for your hair a lot easier. If you are suffering from alopecia or tricotillomania (picking at your hair and pulling it out by the roots); recovering from chemo or other medically-caused hair loss; fine or thinning hair; a bad cut that you need to grow out; or are looking for a transformation from dark winter color to summer blond without damage ... This is the way to go for instant and beautiful results. The gentle attachments and the light weight work together to make it possible to restore hair in the most sensitive and difficult areas such as on the top of the head, temples, mid-scalp, and forehead (for bangs) or on extra-fine or extra-short hair. Very thin or lost hair need no longer be an area of embarrassment for either men or women. And as it happens, this is my area of specialization. Having overcome my own hair loss due to a medical problem (not cancer), I feel a special bond with others who are struggling in this area. "Well, Niki," you say, "I really like the idea of so little or no damage to my own hair, but ... strand-by-strand? That sounds like a lot of time in the chair. How long would it actually take you to do this for me?" Hm-m-m. That's a toughy because there are no one-size-fits-all answers for how long these sessions can take. It really depends on what we're starting with and where we want to end up. For example, it can take anywhere from one hour to add highlites or fix a botched haircut to maybe up to 3 - 4 hours depending on what you're looking to do. This can take from 1/2 bundle to 2 or 3 bundles of hair ... again, depending on the projected end result. This is why a consultation is always recommended. Unfortunately, there are no hard and fast rules with this. Most questions can only be answered in the consultation. I need to see the hair ... Where we're starting from and where the projected end result is. Hand tied. Remy hair ... cuticle going in one direction to reduce tangling and matting. Re-usable. Can be colored and permed. Adds volume, length, or highlights. Stays soft and touchable. Small attachment point. Uses thread. Swings independently of your natural hair so it looks more like your own real hair. Lasts about three months. Quickly applied; easily removed. Easy care. No heat. No bonding. No metal cylinders. Very comfortable to wear. Great for special events; every-day beauty enhancement; correcting very-fine hair problems or medically-caused hair loss such as alopecia, tricotillomania, or growing-in hair after chemo. A very experienced and qualified cosmetologist (Niki). Call 516-816-6452 for all extension services … including (under special circumstances) house calls. Seems to me that this Microchet system has quite a lot going for it! Get all the glances you deserve! It's impossible to put a dollar value on the confidence and self-assuredness that looking your best will provide for you. But it's a sure bet that people tend to perform better and experience more success when they're concentrating on what they're doing; not worrying about how they look. The attachments are so light that the added volume seems like your own natural hair; moves like your natural hair; and can be styled just like your natural hair. In other words, you may even forget this extra hair is an add-on because it even feels like your natural hair. A very confident feeling. And the possibility of damage to your own hair is so minimal with the Microchet attachment method when applied by an experienced, certified practitioner as to be almost non-existent. This alone should be enough to calm your fears about taking the plunge and is worth your weight in gold for you to know you won't end up worse off than when you began! However, as with any hair enhancement product, there is a possibility of damage due to misuse or improper care by the client. Proper care and maintenance will be fully explained at time of consult, but client must assume all responsibility in this area. If you have me do your extensions, it is understood that you are in agreement with these statements whether they have been printed and signed or not. While there is no charge for the salon consultation, if you decide to have the extensions, a non-refundable deposit of $500 would allow for ordering hair and holding your spot. Because of hair growth, all extensions need to be re-done from time to time (usually between 2 and 3 months). In-home visits are special services for those who are home-bound and others who are unable to come to the salon. Consultation and/or travel fees may apply. Sh-h-h! If you don’t tell, they won’t know………. P.S. Reserve your spot early as there’s only so much time….. Once it’s booked, it’s gone! As you read through the above information, did you have any questions relating to your specific situation that were not fully answered? Jot them into the response box (below). Niki will get back to you by e-mail within the next 5 days. Please be assured that this e-mail consultation will not be a thinly disguised sales presentation; it will consist of the best intelligence that Niki can supply without actually seeing your hair. If Niki is unable to help with your particular problem, she will tell you. And if she knows of someone who may be better able to help you, she will refer you. There is no fee associated with this consultation or for a consultation in the salon should you choose to have one there. This is simply a way to help you get the help you need, and to tell us how we can serve you better. Check here to receive more hair tips and announcements through Niki's occasional newsletters. Niki, I just wanted to thank you for the incredible work you did on my hair. People know there is something different, but they can't quite put their finger on it. They look so natural and blend really well with my own hair. I used to have the extensions that were on a taped strip and you would add glue to secure them. Although they did not harm my hair, they were always coming loose. I would constantly worry about them falling out. I would always have to re-adjust them when I washed my hair. My hair felt tacky on the back of my head. Your extension process feels great. I wash my hair and have no fear that they will fall out. I can touch my hair and I let other people feel it to see how natural it is. I would never do that with the other extensions. You are fabulous at what you do. Thanks so much for taking the time to really make me happy with my hair. I even find it easier to do my hair now, it seems as if I have to do less to get it to look great. Thank you a million times over!!!!!!!! "...you made me look absolutely beautiful!" I don't know if you remember me but I was the girl who came in in late April and you did my hair. I had an audition for West Side Story the next day and you made me look absolutely beautiful! I did not make the show, but my hair looked fierce! The cut, the rinse, and just the TLC you gave my hair was really something. I remember how scared I was because I had never dyed my hair, but you reassured me and I looked freakin fierce! I wanted to thank you so much and the next time I make a trip to NYC I am seriously coming to you for another hair appointment. You gave me the best haircut, style, and color I have ever had! Thanks so much! I just want to tell you how thankful I am to have met you. I had not visited a hair salon in ages since the last hair disaster a few years ago. The care I provided to my hair was poor so it was reflected in my first visit to you. To be honest I was afraid but as soon as I spoke to you my doubts were dispelled and a sense of trust in you, in your abilities settled in me. I found your website, read its content, and realized that I had finally found a Hair stylist with integrity and compassion. You have the ability of making anyone feel at ease in any circumstance. Thank you so much for your healing hands. Keep the good work. I am looking forward to my next visit. All the best and until soon. Hope to see you soon and I hope all is well. love, love, them!!! And the joke is, no one can tell, I just keep hearing how young and fierce I look! Great job girl! See you soon! I found Niki through my sister who found her online. We were looking for an alternative to the usual hair extensions. We tried them all. I have to say that the Microchet method is great! if feels great on the scalp and looks great. Niki goes out of her way to make sure you are happy. She has a great personality, I already referred her to one of my best friends who just had hers extensions done last week and they look and feel terrific. They really are so light on your head I can't see ever going without them.